8.9" x 7.9" stitched on 14 count. 6.9" x 6.1" stitched on 18 count. 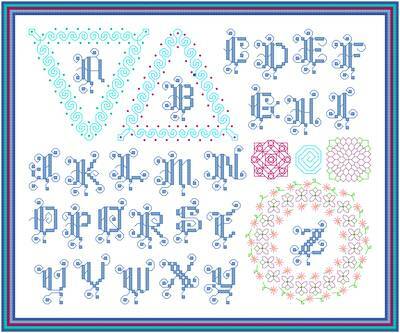 Fancy Monograms / Sampler cross stitch pattern... Use monogram design with removable waste canvas to personalize anything stitchable. Letters and 3 frames are provided. Colors and threads of choice may be used. May be used as a sampler.